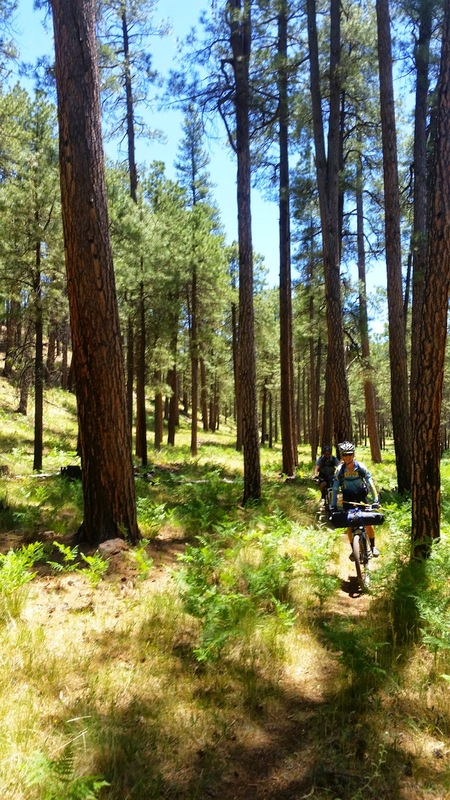 Summertime in Phoenix means it's time to head north to the cool(er) pines. 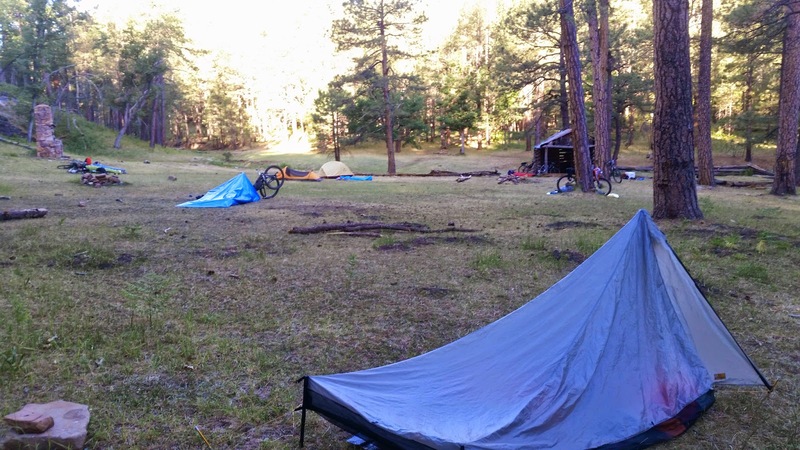 Last year's bikepacking101 ride was a hit, so why not do it again. 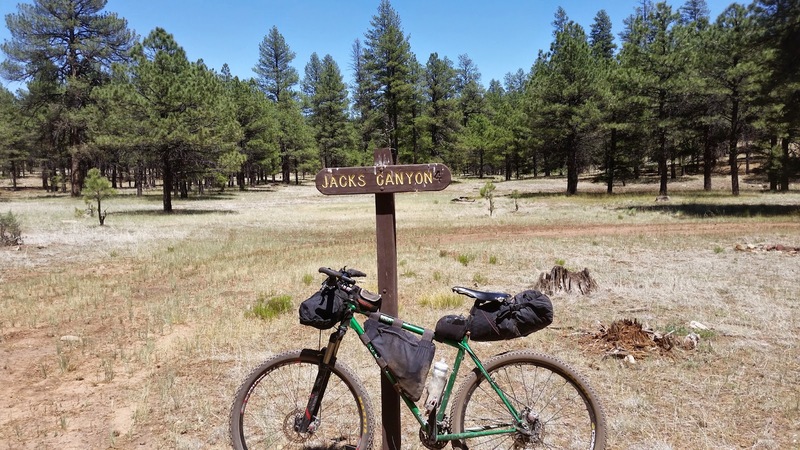 This year I wanted to find a mostly dirt route back to the car from where the AZT intersects AZ87 avoiding 17 miles of shoulderless paved riding. Topofusion to the rescue. I poured over some topo & aerial maps and had a route. Time to see if it panned out. I bolted the balmy confines of urbania around 3p. It was 108º. A little under 3 hours later I was pulling into my camping spot for the night, windows down, pine infused air filling the car. It was 75º. Perfecto. I set up camp and walked around a bit taking in the lofty views. This greeted me only a few yards from my tent. A quick sidenote: K & I had been T-Mobile customers for the past 10 years, mostly due to a generous employee discount at the time. Over the years the service & coverage seemed to go in the toilet, and especially in the backcountry. It was extremely rare for me to find a signal outside of town, heck, most small towns didn't have a signal. But by some stroke of dumb luck I had a signal with T-Mobile up here last year!! Fast forward to this year and we finally broke free from the 'T' and made the switch to the AZ backcountry friendly Verizon. Fancy new phones to boot. So, it was to much surprise when I tried to text the others of my camp location only to receive a 'message not sent' error!! What?!?! After an hour or so, I was able to finally get one text out to Lee & Kate. No such luck to Carlos. I called it an early night, climbed in the tent at 9:15p. At 9:20p Lee & Kate showed up!! We hung out for a bit then I crashed out to a good nights sleep. The next morning as we were packing up I began stuffing my sleeping bag into the compression sack....rrriiipppp!! Drat. It was toast. Thank goodness Kate was driving SAG support on this one. We met up with most of the others over by AZ87 & FR300, Seron & Jason had just arrived, while Holly was bouncing around the forest roads sans GPS. No sign of Carlos, so we finalized our gear and rolled out hoping to catch him along the route after Holly tracked us down. 5 riders started out, Kate was driving SAG support, i.e. beer for the campsite!! Way to go Kate!! FR218 was first. Photo by Seron. 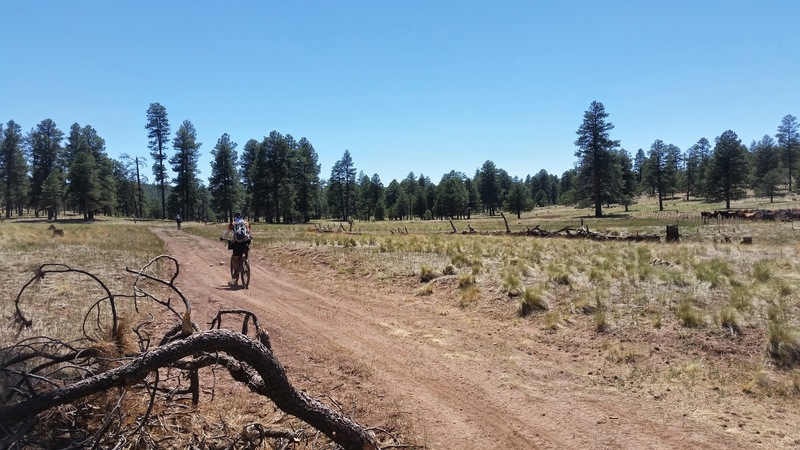 We rode past the prior nights campsite then met up with FR300, aka the Rim rd. I'm fairly convinced FR300 is one of the best dirt road rides in the state. 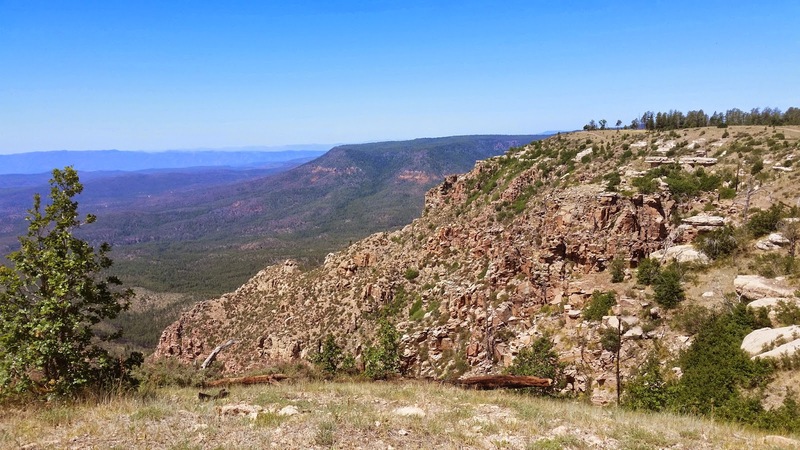 The road undulates along the Mogollon Rim, allowing riders to take in a multitude of sweeping vistas. I'm reminded of the Great Smoky Mountains from back east, just a bit more clear!! Lee enjoying the view. Photo by Seron. Jason taking in the sights as we head east. Photo by Seron. 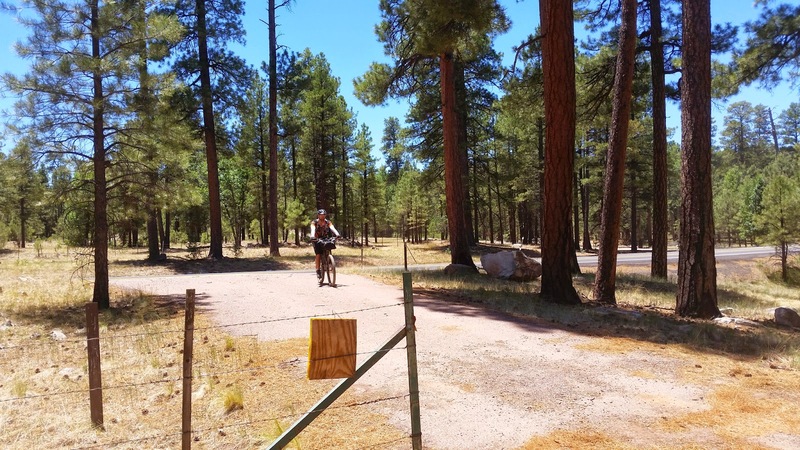 We kept our cruising pace along FR300 and before we knew it the Arizona Trail (AZT) sign was welcoming us onto the Cabin Loop trail system. We also found Carlos & Candice waiting patiently for us, our group had now grown to 7!! 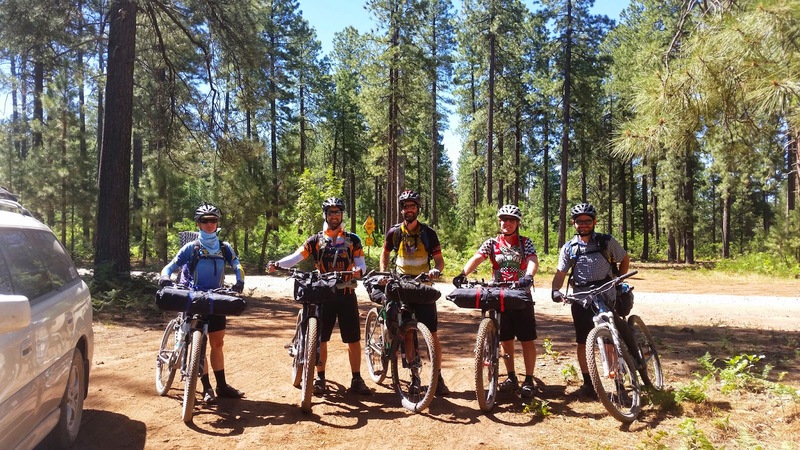 Lee had some tire issues at the top of the decent into the AZT, so he missed out on our random photo op from a day hiker. 6 of 7 accounted for. Photo by random hiker dude. We were only about 7 miles from our campsite so daylight wasn't an issue. 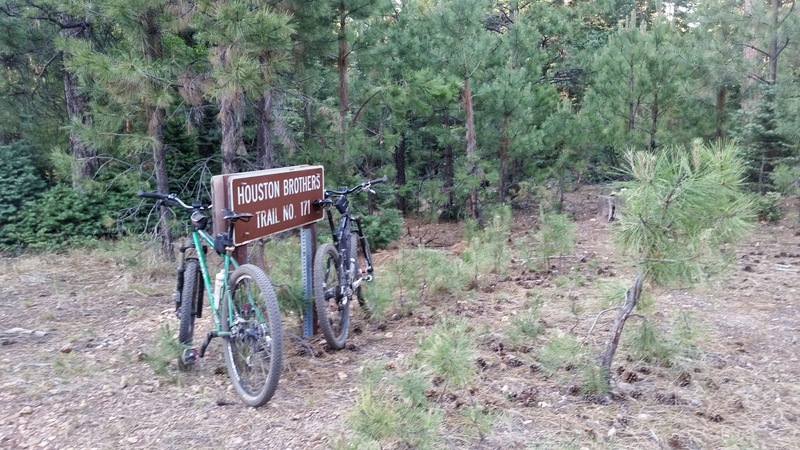 The first trail, Fred Haught, shares 3 miles with the AZT before continuing on to the second cabin, Pinchot, at the junction with the Houston Brothers trail. 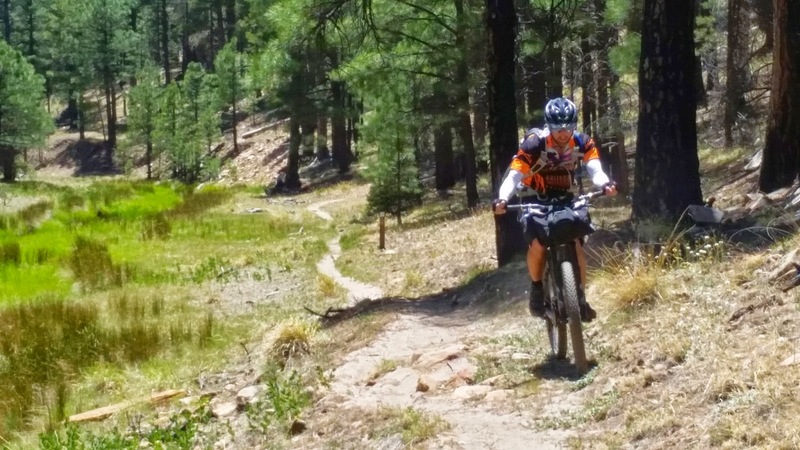 I'd classify these trails as advanced intermediate, some techy sections, grunt climbs, some sand (a bit more than usual since it had been over 100 days since the last rainfall) and of course a couple punchy hike-a-bikes (HAB). 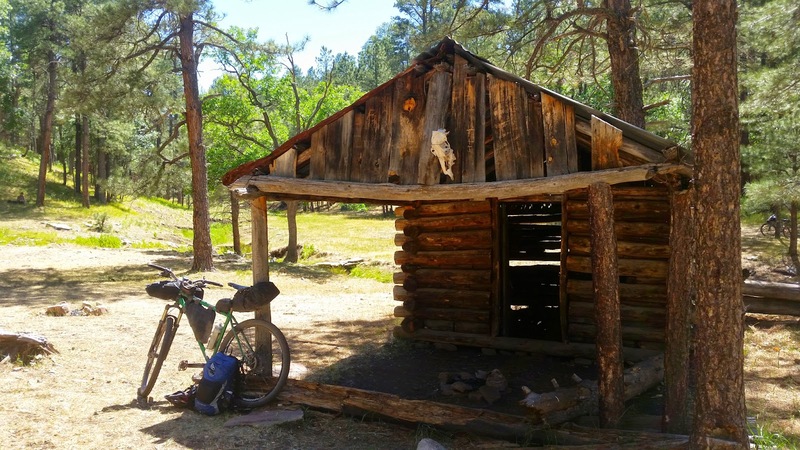 First cabin of the loop, General Springs, right at the beginning. History lesson for the day. 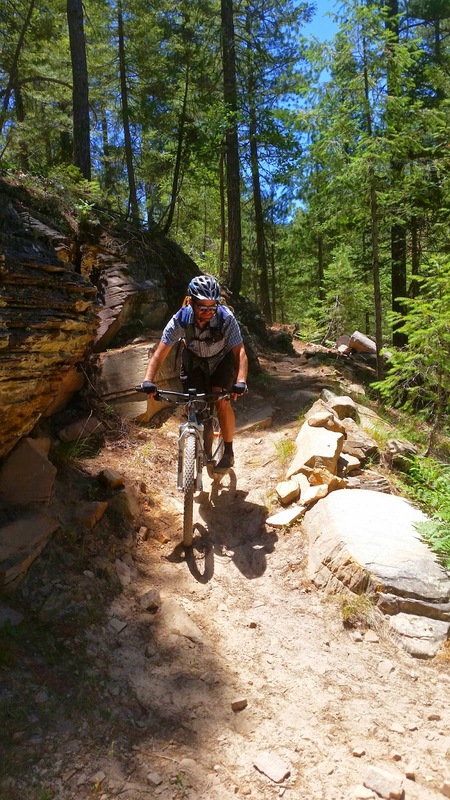 Jason cleaning a tight switchback, yeah!! Lee rolling with a rear tube. Carlos working a sharp right. Photo by Seron. 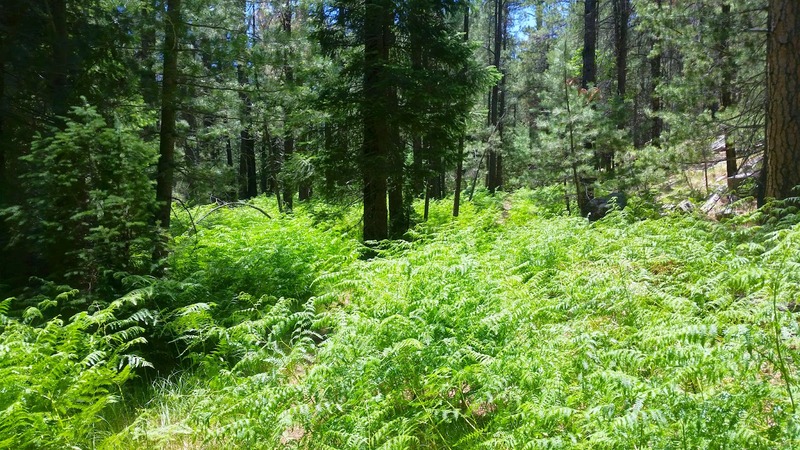 Deep ferns burying the trail...awesome! Holly rippin' through a fast piece of trail. 1.5 miles of pleasant climbing until camp. Crossing the light flow from Aspen Spring. Photo by Seron. Aspen Springs, great place to call camp. 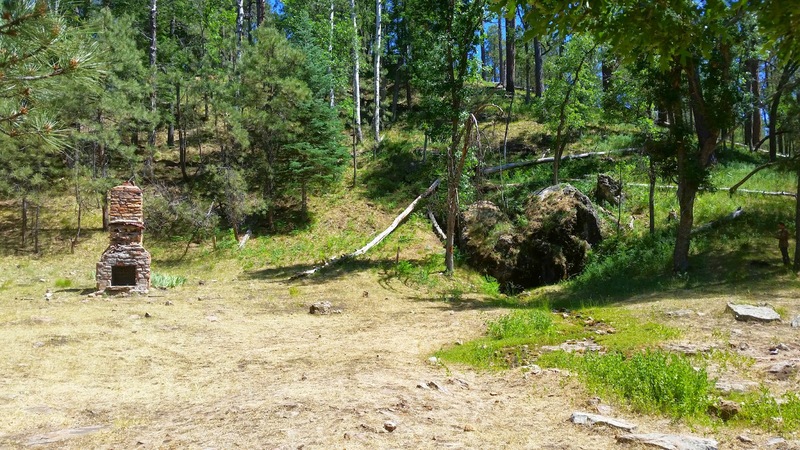 All that remains of the historic cabin is the brick fireplace, the spring flows from under the giant boulder on the right. 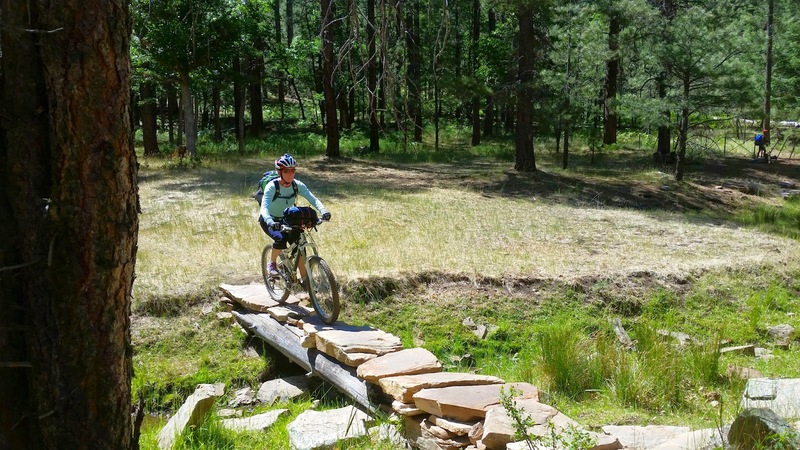 Candice making the rock bridge crossing. It was still early, no sign of rain and no Kate with the SAG wagon yet. Almost everyone crashed out for a nap in the grass. I went for a little hike up the hillside. A bit later Lee took off up the road in hopes of flagging Kate down. He didn't return for a while so a few of us went up to see what was going on. The next forest road was about a 1/2 mile away up a short hill, but the gate was wired shut extremely well, only a side opening for bikes existed. A few minutes later Kate came down the road, we had beer!! (and I had a sleeping bag!). Now we just have to get the stuff down to camp. Beer transporter. Photo by Seron. We even loaded up Hank with a few beers. Photo by Seron. Back at camp the others were stirring, so we went for our out-n-back ride on the Houston Brothers trail. 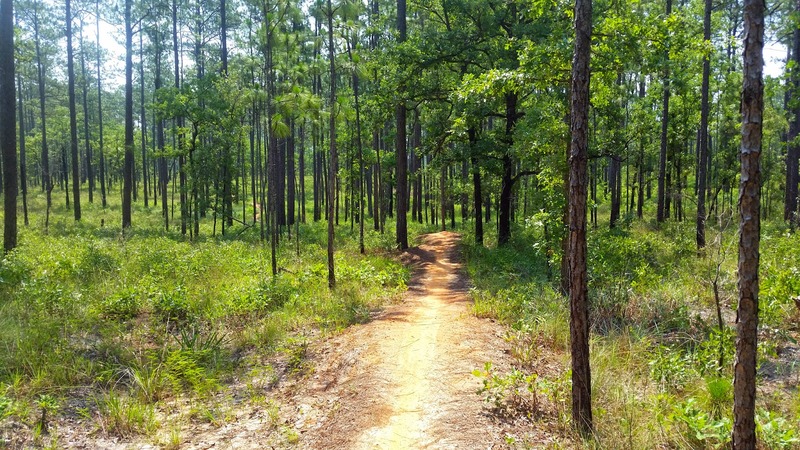 It's a fantastic 4 mile stretch of trail gradually climbing up to a forest road. We only had 2 1/2 miles to go from camp, so we made quick work of the round-trip fun. Team Voodoo at the turn around point. Back at Aspen Spring we all chilled in the cool alpine evening. Right before sunset 3 other bikepackers came rolling through, plenty of room for more. Nice to see a few others out there enjoying the area. The night was perfect, not a cloud in the sky and no moon. The stars were amazing up there. I slept like a rock. I don't think there were any ghost stories floating around, only the occasional wisecrack. Photo by Seron. I was up early the next morning, perhaps the first to really get stirring. I wanted to get my things together, since I had to shlep my sleeping bag back up to Kate's car. Seron must've really been knocked out, Jason had to rustle him awake!! Everyone was ready to roll, but Lee opted to do some sightseeing with Kate and Carlos took Candice on a shorter route back to their truck. 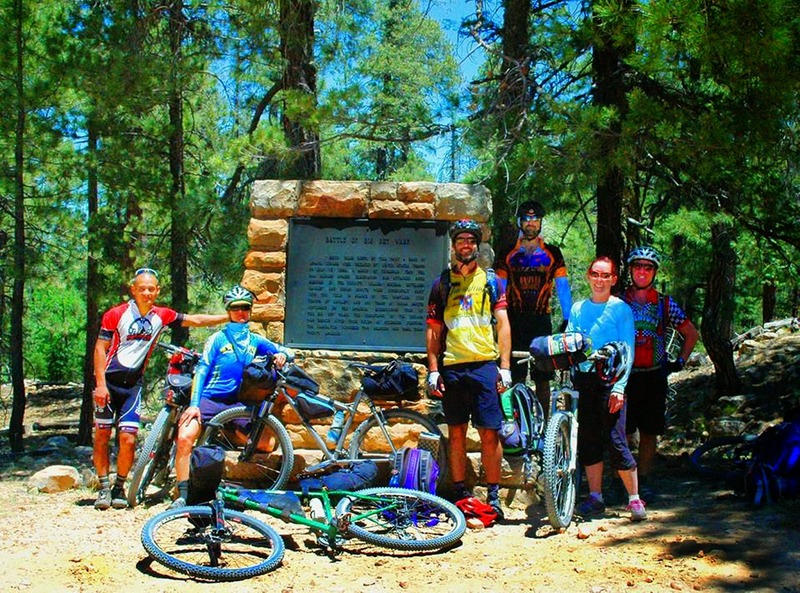 Holly, Jason, Seron and I were going to take the longer AZT route back and hopefully discover a dirt connection back to the cars. 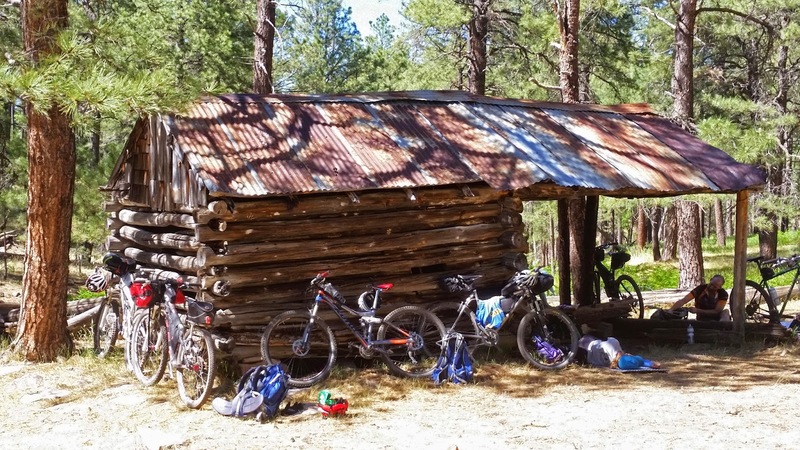 Taking a break at the AZT split. Photo by Seron. 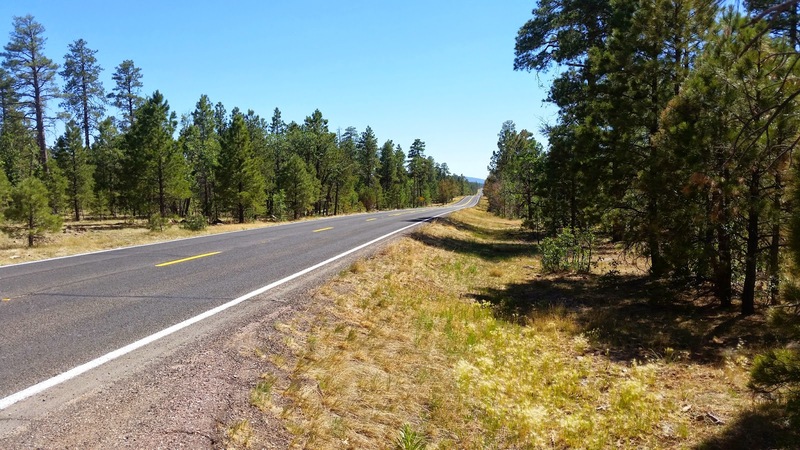 We made relatively quick work over to the AZT turnoff. We took a short break knowing there was a 10-15 minute HAB fast approaching. It went by quicker than I remembered and the following miles on top of the mesa seemed to keep going and going. Now this wasn't a bad thing, those are some darn good miles!! Holly gaining momentum after the first HAB. I was really digging the flow up there as we were led to our biggest obstacle of the day: Blue Ridge Reservoir HAB. It's a steep drop down to a flat rocky dry riverbed, it's downstream of the reservoir, followed by a 20-40 minute HAB up the other side. Even with the extra gear, I felt really good, so I gunned it for an attempt at a personal best for the HAB. The others got going while I took down a small snack, then it was go time. My goal was a sub-19 minute attempt. Seron's GPS shows the upcoming Blue Ridge dip. Some chunk going down, but mostly rideable. Photo by Seron. Jason begins the big push. Holly's loving the HAB!! Photo by Seron. 'On your left', pushing my way to the top. Photo by Seron. I hoofed it to the top checking in at 18:02, I'll take it!! A much deserved breather was in order at the top. The next segment of trail has a good amount of lava rock, so it's not the smoothest. That only lasts for a mile or two before opening up to some fine meadow crossings before making the long chunky descent into Blue Ridge Campground. Topped off our water & cooled ourselves down as it was getting warm. 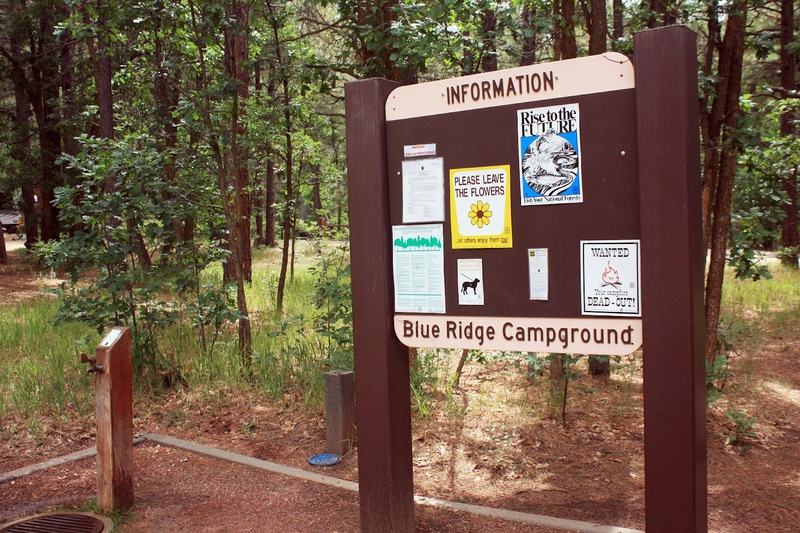 Shortly after passing through Blue Ridge CG the trail crosses the paved AZ87. 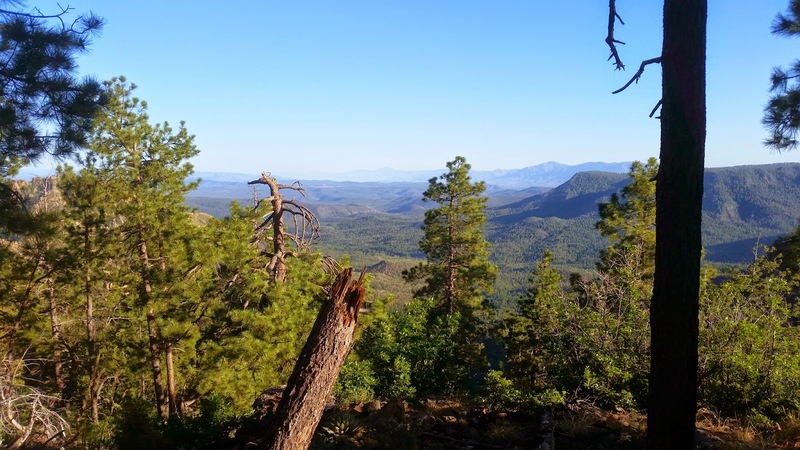 It also completed passage #28 of the AZT, which begins at FR300. 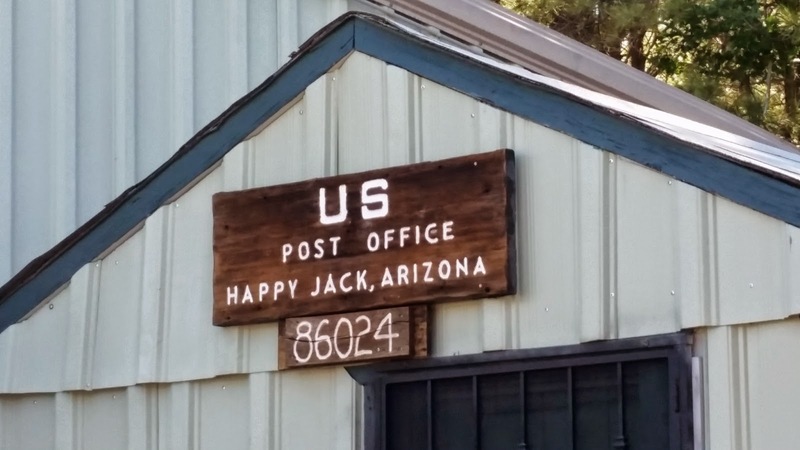 We were now on the Happy Jack passage continuing to head north for the next 4 miles or so through Jacks Canyon. It was beginning to get toasty and we were all feeling it. 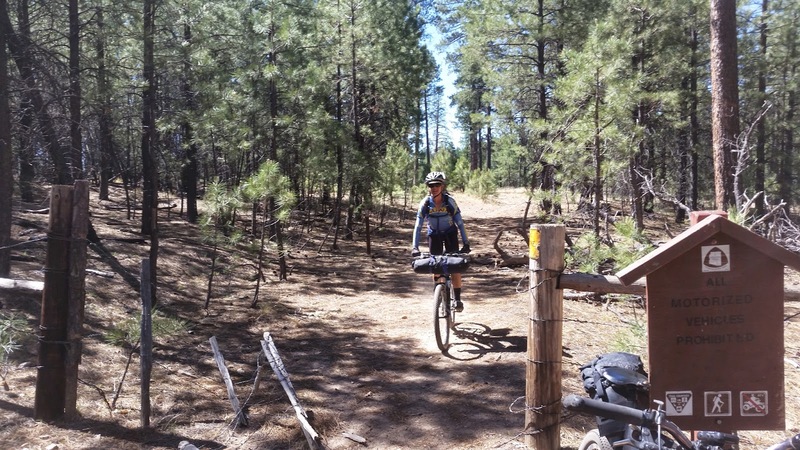 We stopped for lunch under the shade of some pine trees where we'd veer off the AZT for good onto some graded forest roads. This final section was all new to everyone, trusting in the topo map created route. 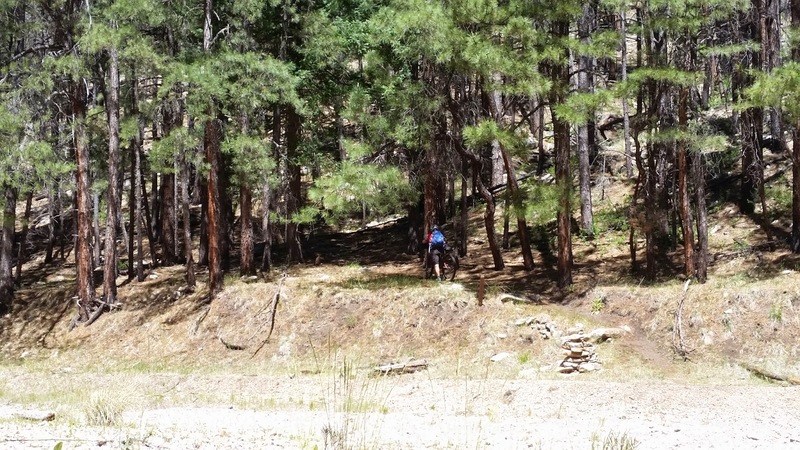 A few easy miles led us to a sustained downhill, an approaching turn gave me pause as it was nothing but a dry creekbed littered with babyhead rocks!! I think we'll pass on this option. It was an easy re-route, a mile down the road and hang a right, back on track. 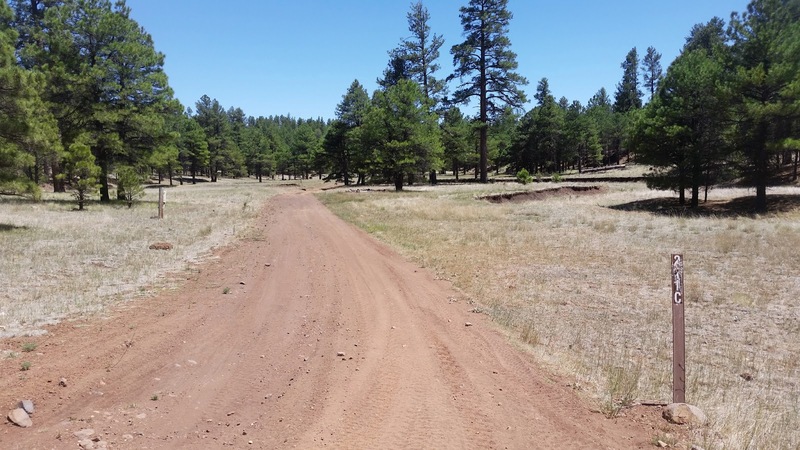 A few more easy graded dirt road miles passed on FR211. We then proceeded onto FR211F for a mile or two until we came to a gate. A padlocked gate!! Crap. 'No Tresspassing, Private Property' signs were strewn along the fence. Let's see what the good 'ol Garmin has to say. Stopped in our tracks. Photo by Seron. It's exactly these instances when having a GPS loaded with regional topo maps can really save the day. We weren't lost by any means and could have easily found our way back to AZ87, but why do that when there surely is a dirt route to explore!! A quick group consultation and we backtracked to FR211 to ride a bit farther down the road to FR211C. Crossing through Jacks Canyon on FR211F. FR211C provided a solution around the private property. Seron dropped his camera around here in the moon dust. 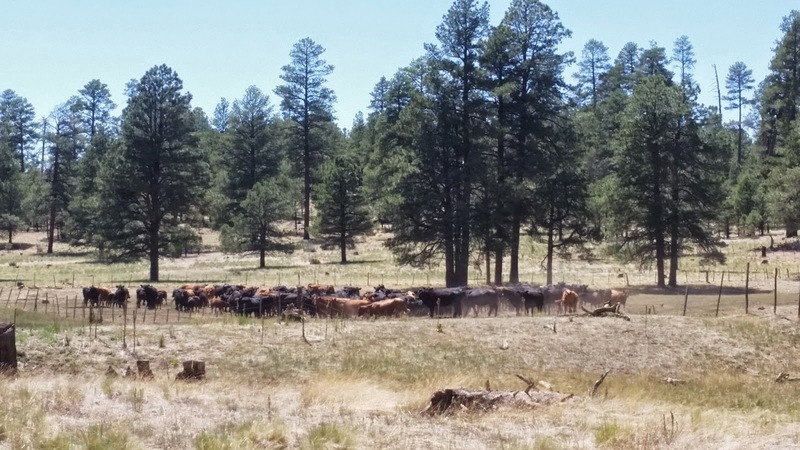 I crested a small hill that dropped me into a large open meadow, it was filled with cattle. They watched as I approached then one made a move and it was on...stampede!!! Ok, maybe not a stampede, but they all herded themselves rather nicely to their fire drill location. It was cool to see. After the dust settled, I could see another gate approaching. Hmmm, this one better not be locked!! It wasn't, only a cattle guard crossing. We all regrouped and proceeded down the road of moon dust, it was so dry up there. The monsoon storms will do wonders when they arrive. We made it back into the trees and rejoined the original route. A few miles later we began to climb, it wasn't super steep, but enough to make you work for sure. The higher we went the more technical the terrain became. Our nice forest road had turned into a full on 4x4 jeep road requiring high clearance. It was very technical riding at the top. In hindsight, I think this climb tipped the scales for us wanting the ride to be finished. Clints Well was going to be a welcomed sight. 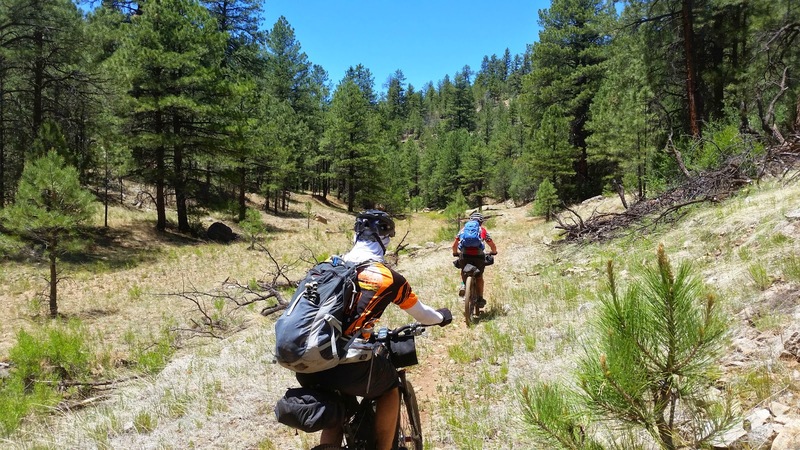 We had guestimates of how many miles remained and were hopeful the forest roads remained friendly. We rode on looking for our next turn, it never came. My track showed a forest road veering off to the right, but nothing existed!! Onto plan D I believe. We stayed on the main forest road and gladly welcomed AZ87 as our direct path to Clints Well and some much deserved cold drinks. AZ87 a few miles north of Clints Well. At the store I promptly downed a chocolate milk, oh so good. All refreshed the four of us, practically in unison declared an AZ87 finish. There were more dirt roads to explore on the east side, but we were getting tired, it was warm, plus we all had the long drive home. Take AZ87 and be finished in an hour or continue to explore, making two rather large climbs on unknown road conditions? It really was an easy decision. With that said, I still want to check those roads out, it's such a beautiful area. Clints Well service station & post office. We had one big road climb ahead of us and unfortunately no shoulder to ride on. The traffic was kind to us and we arrived back at the cars around 5pm. I want to thank everyone who came out for this ride, it was a blast. 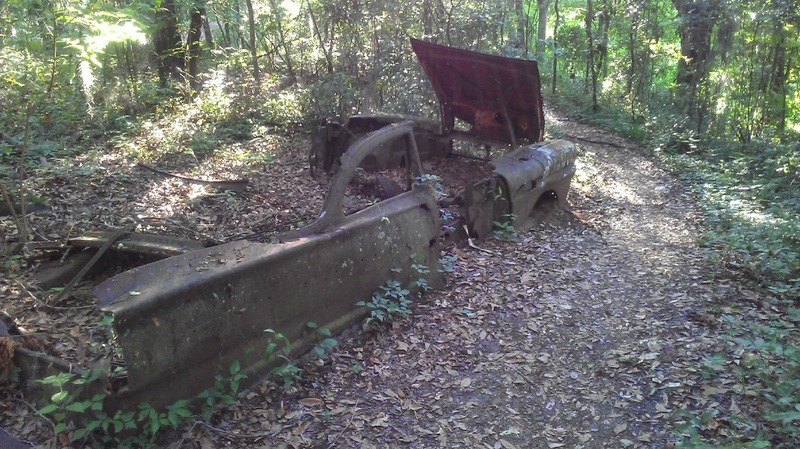 Especially, Seron, Holly & Jason for tagging along some unknown forest roads. I think this ride will be an annual trek. 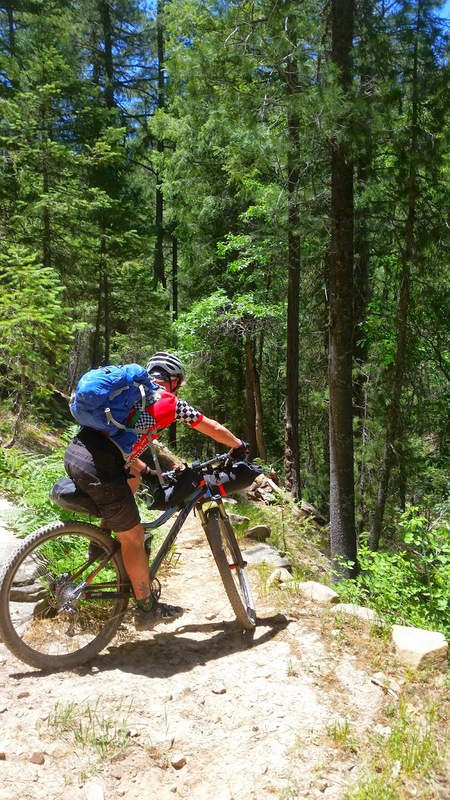 I would like to see more first-time bikepackers take the plunge. 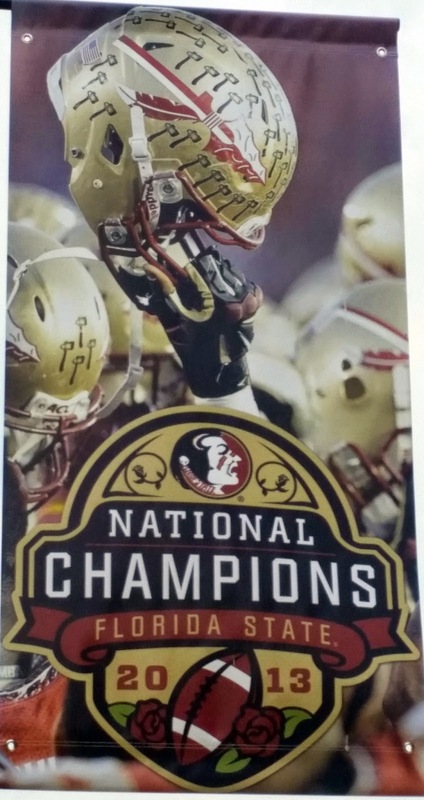 Here's to next year!! 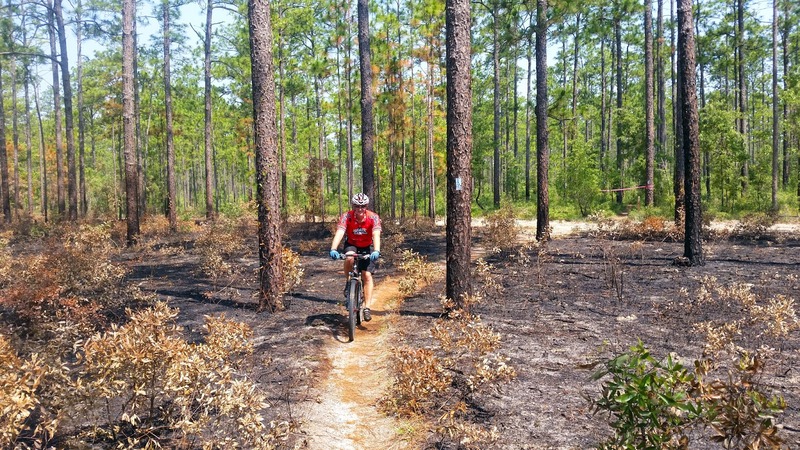 Florida mountain biking. Is this some kind of joke? 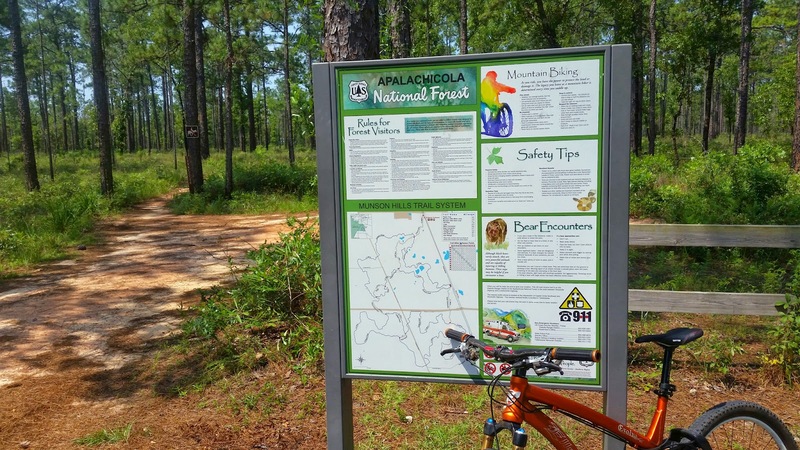 Afterall, the highest point in Florida is 345' above sea level. Visions of flat sandy loops in the muggy air began dancing in my head. 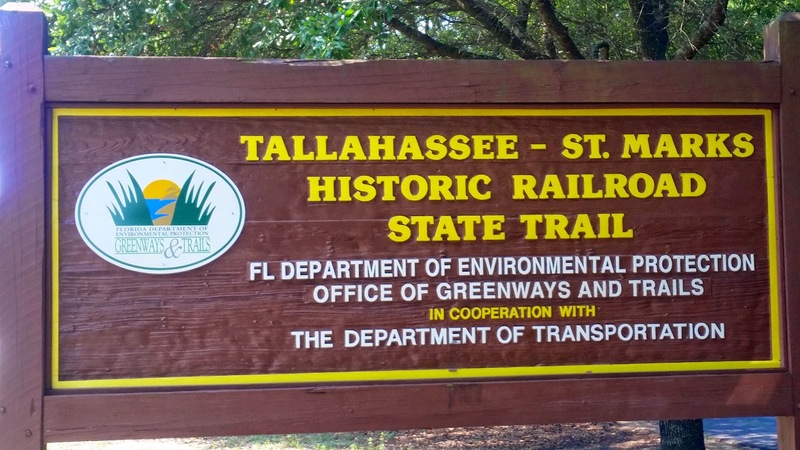 But we were heading to Tallahassee for a HS reunion of K's and last time I checked Tally-town had some hills. As luck would have it, one of K's classmates, Mark, was trying to organize a mountain bike ride the morning of the reunion. I quickly informed K that I'd go for the ride if we could round up a bike. Mark's buddy stepped up and lent me an Ellsworth Evolve FS 29er, perhaps a bit overkill for the area, but no way I'd turn it down!! As it turned out, it was just Mark and I on the ride. So Mark decided to give me the grand tour!! Unfortunately for Mark, he was up late changing a flat on his vehicle, then proceeded to find his pedal had busted leaving only the spindle!! To his credit, he sucked it up and rode with the broken pedal, keeping inside pressure on it so it would 'mostly' stay on the bike!! 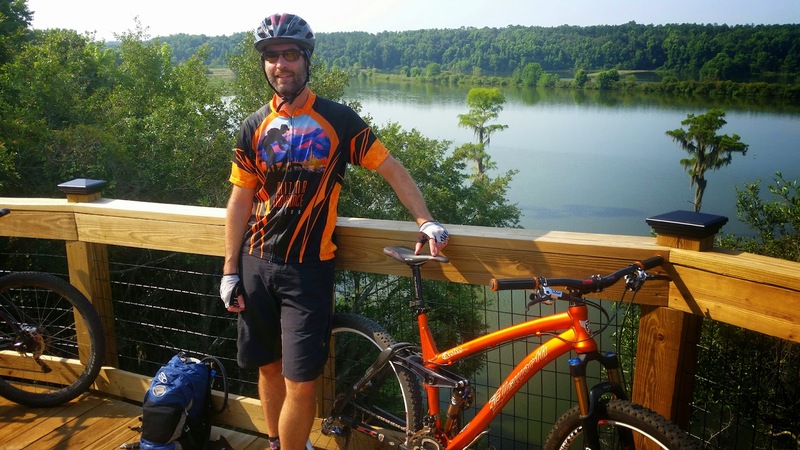 Most of the trails we rode at Tom Brown park are on the opposite side of the lake. We started our ride at the high school near Tom Brown park. A few short connectors later we were weaving our way through a forested singletrack masterpiece. 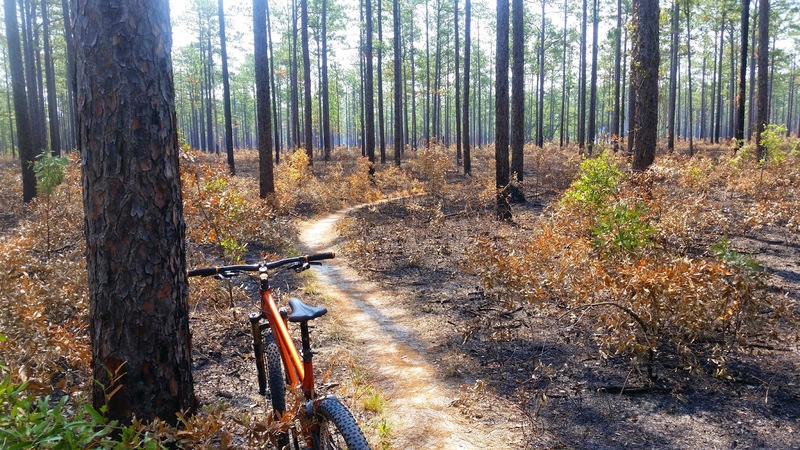 What Florida lacks in elevation gain is easily made up in terms of pure FUN. 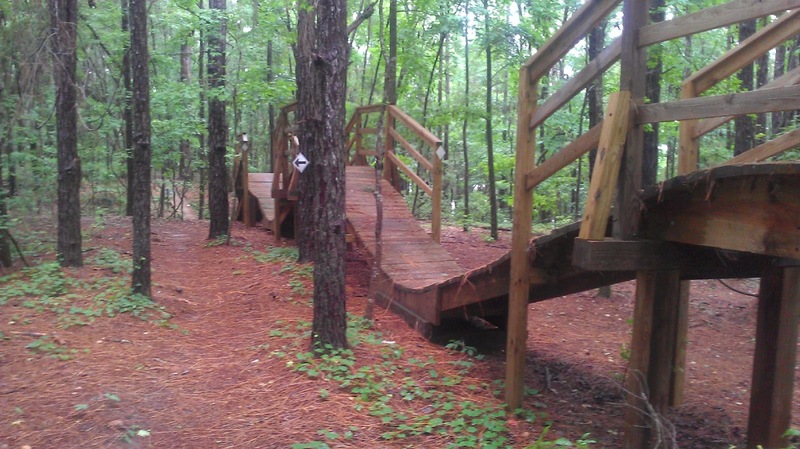 These trails were purpose built, flowed fantastic, often having slightly banked turns, wood features thrown in for optional challenges and other off-chute areas to play on. 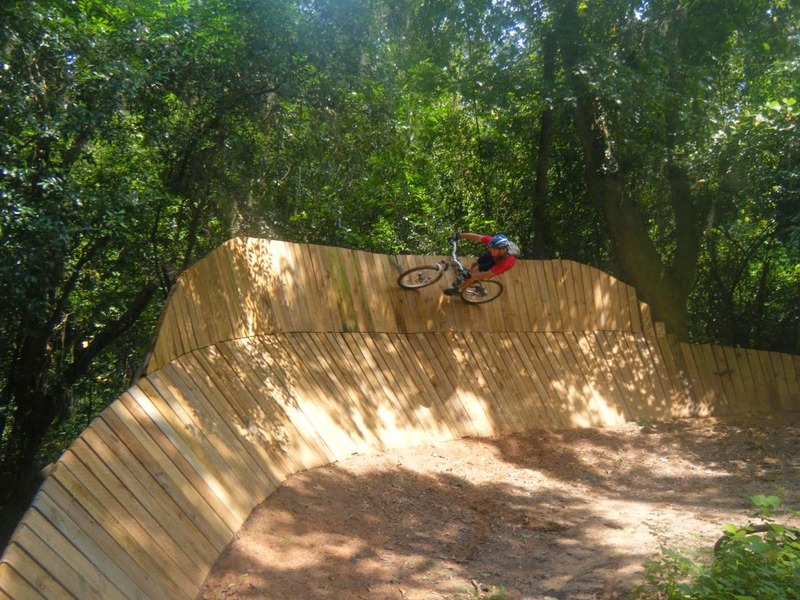 Those areas included a BMX track, downhill jump line and giant wooden wallride!! At least there was a lot of shade!! We started early enough to avoid some heat, but the humidity was already kicking into gear. To be honest, I wasn't nearly as affected by it as I would have thought...well, that is, until we stopped moving!! Whoa. Just keep pedaling and it's fine!! 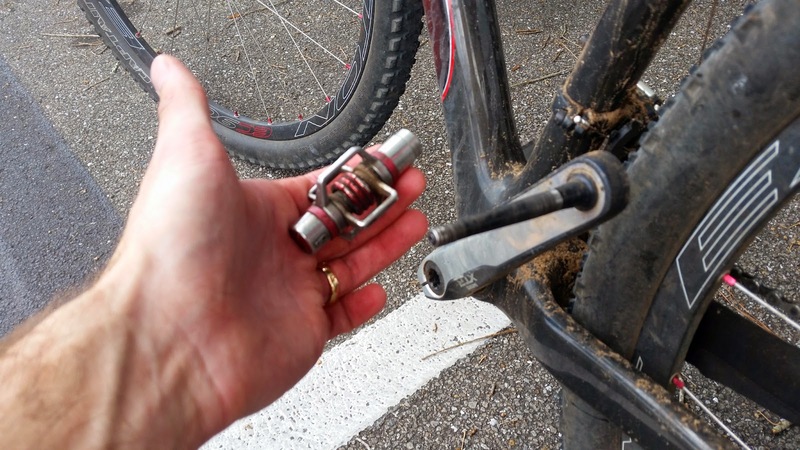 We then made our way to the Munson Hills trails via neighborhood roads and a couple trail connectors. These trails are even faster than those at Tom Brown Park!! 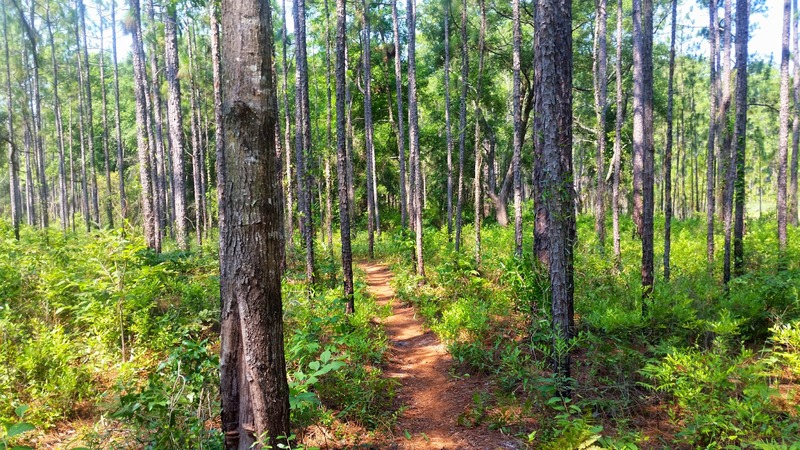 Packed orange clay through the green pines of the Apalachicola Nat'l Forest. The only real trail hazards were the occasional mix of fine white sand or the tight squeeze through the trees, beware 700mm bar riders!! Plenty of miles can be had here, all the way south to the Gulf. More info. The trees start to blur the faster you go. 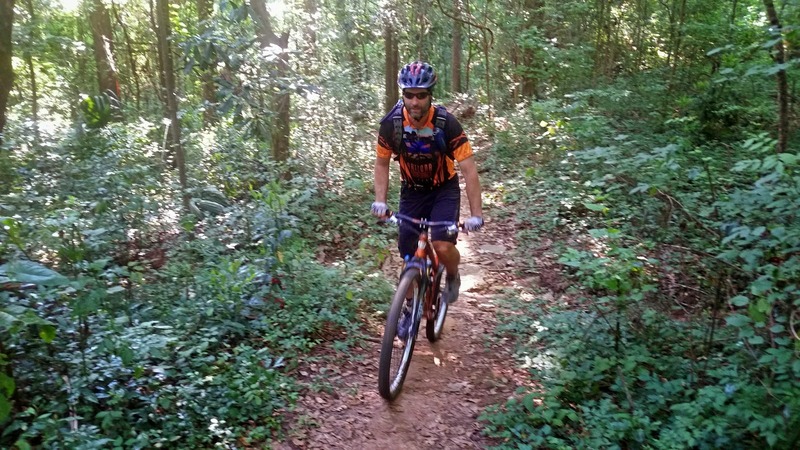 Mark still pedaling on the busted eggbeater. The loop was filled with gradual ups & downs. We interrupted our return ride for a brew, then made our way back to the high school on mostly the same route. 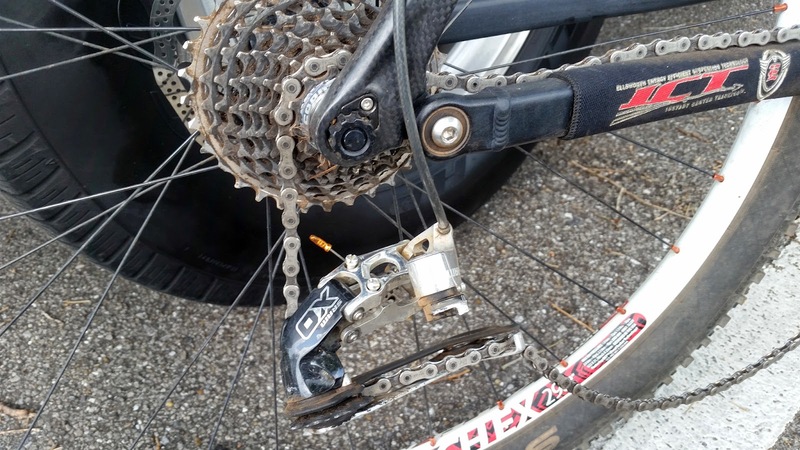 On one of the last rises in the road I noticed the rear derailleur started to wobble, next thing I knew the hanger snapped!! What?!?! Time to walk. Luckily for me it was only a couple of blocks, then a slight downhill coast over to the car. 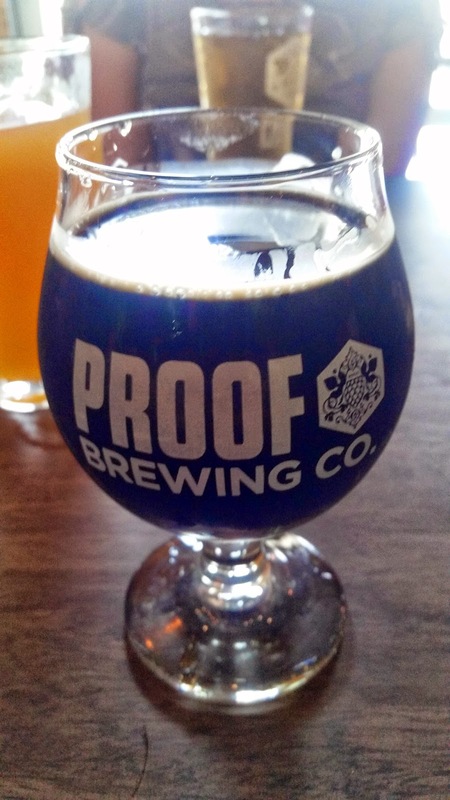 The next day we went downtown to sample a relatively new brewery, Proof Brewing Co. They had a very tasty orange-vanilla porter. Check 'em out.